Personal: Lives in Bringhurst, IN, with his lovely wife. He has one daughter and four wonderful grandchildren. Hobbies: Roger likes to go camping and fishing in his spare time. He enjoys spending time in the Great Smoky Mountains for fun and relaxation. • Climb the ladder of success by developing and promoting others around you to achieve their full potential. Favorite Quote: "Never, Never, Never, Give Up!" Roger is currently Director of Operations for Team MJV and works closely with the Operation Coaches and management team. 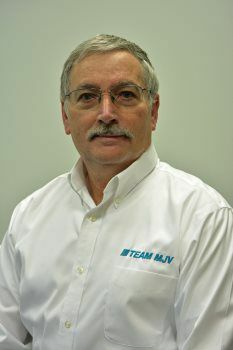 He has worked for Team MJV since April 1997. He has sold janitorial equipment and supplies, been responsible for training personnel and assisted in opening numerous accounts. Roger enjoys being involved with training and new account start-ups. He has attended and participated in several seminars, training programs, equipment shows, floor care, leadership and motivational workshops. Roger knows and understands that to be successful in our business, we need to equip our team with knowledge, skills, proper equipment, chemicals, leadership and empowers our managers to go out and get the job done. Roger believes we must surround ourselves with excellent leaders to continue to grow our business.